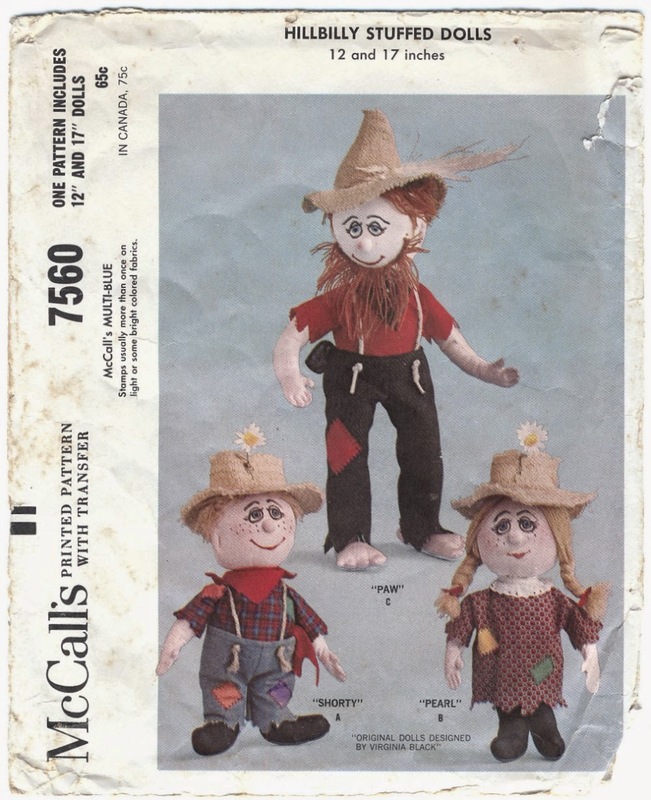 McCall's Pattern #7560 makes three "Hillbilly" dolls - Paw who is 17" tall, and Shorty and Pearl, each 12" tall. 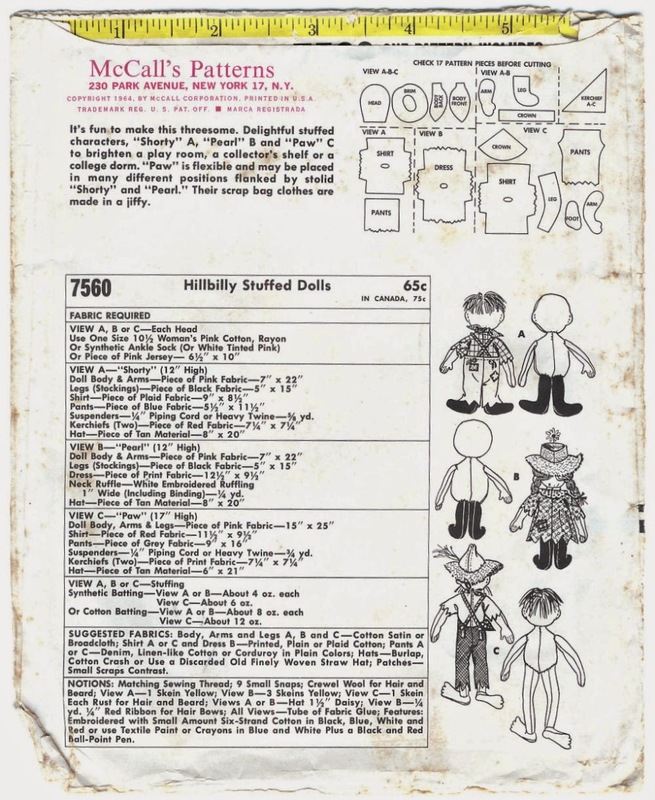 Designed by Virginia Black, they were clearly inspired by the popularity of "The Beverly Hillbillies" television series which was the number one show in America at the time. 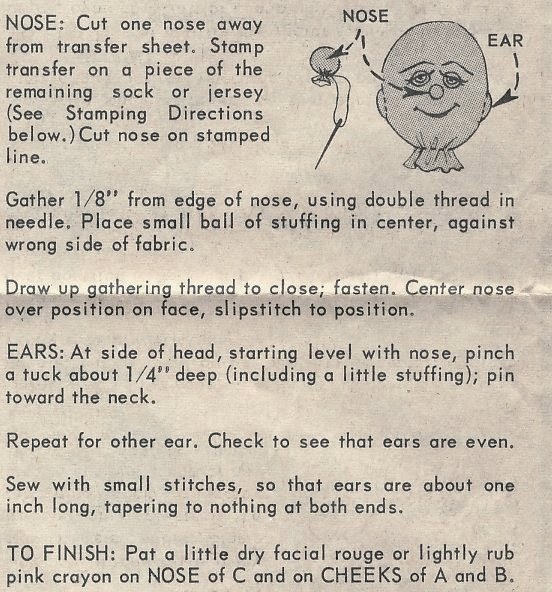 These dolls are made with an unusual method that calls for their heads to be made from either pink jersey knit fabric or a women's pink ankle sock (instructions are given for both); while the rest of their bodies are made from woven fabric such as broadcloth. Both the large and small dolls have applied noses, choice of embroidered or drawn features, quarter-seamed torsos, mitten hands stitched to indicate fingers, and crewel wool yarn hair. The main difference between Paw and the kids is their legs and feet; Pearl and Shorty have one-piece legs and feet cut from black fabric to resemble stockings, while Paw's bare feet are constructed separately and then applied to his legs. Paw also has a beard made from the same yarn as his hair. 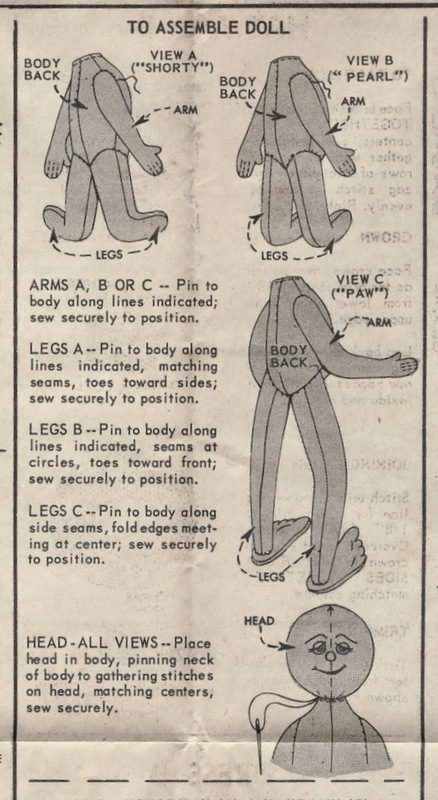 The clothing of all three dolls is simple to make, with the patches added to the pieces before the side seams are sewn. Paw and Shorty have "suspenders" made from piping cord or heavy twine. The dolls' hats can be made from burlap, cotton crash (?) or an old finely-woven straw hat. These dolls are charming characters which evoke the pop culture of their time. They would make a great gift for a fan of the Beverly Hillbillies or bluegrass music.